Karva Chauth is on November 2, Friday in 2012. Karva Chauth is observed by the Married Women. Karva Chauth is being fasting thought the day should not taking drop of water. Karva Chauth begins with the Sunrise and it ends with the Moonrise. Women observe this fast for her husband well-being, prosperity and longevity. It is traditional for the sargi to be sent or given to the woman by her mother-in-law. Karva Chauth is celebrated on 4th day of Krishna Paksha or dark-fortnight in the month of Kartik. The festival occurs 9 days before Diwali. Fourth day of the new moon immediately after Dussehra, in the month of Kartika Masam. It is observed mostly in October or November. Karva Chauth means Chauth is considered to be the fourth day and Karva is an earthen pot. 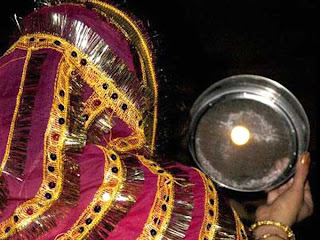 The festival of Karwa Chauth is celebrated mostly by North India. Especially Punjab, Rajasthan, Uttar Pradesh and Gujarat. Karwa Chauth is an occasion that unites people to gather and to get new Friends. Exchange gifts and share home-cooked meals with the neighbours. The gifts exchanged on this occasion reflects joy, splendour, brightness and happiness of a married life. Nowadays application of Henna is common like for Festivals, Parties, weddings. Henna application is seen in Karva Chauth day. Henna application is an age old tradition that symbolises luck and prosperity. 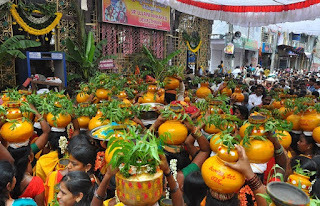 Shiva, Parvati and their son Kartikeya are worshipped on this day along with the Karvas (earthen pots) filled with sweets. In the evening This Karvas will be exchanged between neighbours who are observing fast. The fasting women first sees the moon through a sieve then husband and then break their fast. Firstly water will be drinked then the food. Generally Red or pink Saree will be preferred. Newly married woman wears the wedding dress and ornaments. Karva Chauth preparation will be started before few days of the actual festival means sweets preparation and sargi. On this day is passed with the listing of Karva Chauth vrat katha.